A specially formulated detergent deodoriser for the treatment of urine deposits in carpets and fabrics. 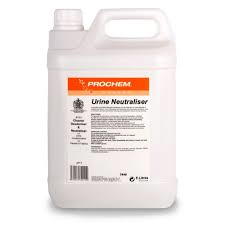 For general use and heavy contamination, use Urine Neutraliser undiluted. For light duty applications dilute Urine Neutraliser with an equal part of water. Always pretest carpet or fabric for colour fastness before proceeding. Apply solution directly to contaminated area with sprayer. Blot with clean white towel, mop or sponge and allow area to dry.